I unpublished this post on medium, so I think I'll just share this post here. Currently, I am a second year Computer Science student at University of Indonesia. I started my college life in 2016. For your information, I don’t have any computer background in High School. Actually my real choice was electrical engineering, but because one and another reason, finally I became CS student. However I’m glad to be a CS student.I was playing Dota 2, when I read the announcement of the approval as CS student. I was glad because I knew I would go to college that year. I was thinking to take a gap year if I wasn’t accepted in any public college. After saw the announcement, I continued playing Dota 2.I started my college life in June, and that was an exhausting month. I had to attend many orientation programs. There were many assignments such as collecting signature, writing some essay and coming to choir exercise. I hadn’t written real code yet those days. 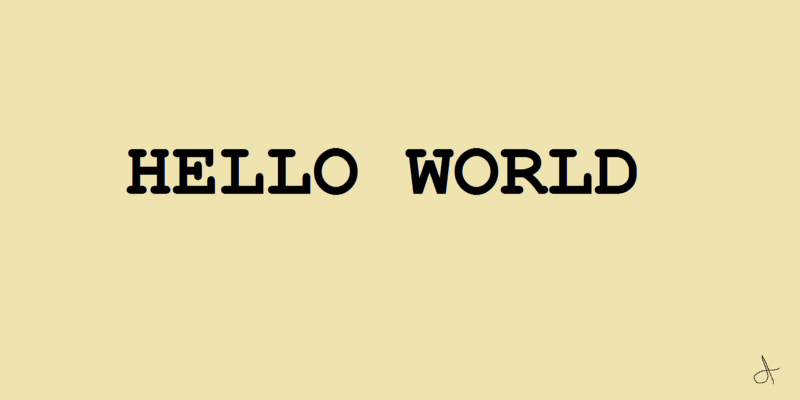 Yeah, I have written some VB code in Junior High School, but I think that doesn’t count.I wrote my first code in August and it was not “hello world” code. It was written in Python. I wrote it in my very first programming lab. The task was Turtle, graphical library from Python. My lecturer never taught it to me in classroom, so it was surprising me. At the time, I remembered when one of CS student came to my school and said “The first thing that we learned in college is turning on the computer”. So, I thought that is a lie. 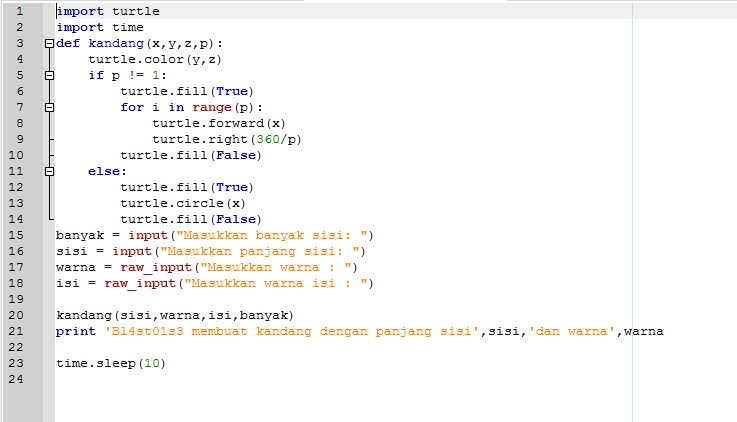 Finally, after read the documentation of Turtle, I could finish my task and it became my very first code. It wasn’t too bad, was it? Besides programming, there are many difficult courses in first semester such as physics. I thought that was strange when CS student had to study physics because it was irrelevant. I love physics but I don’t like to take physics exams. At the time, I had to memorize all of the formula and understood the concept at the same time. Fortunately, I had few friends to study with. One of them is very smart and I learn many physics concept from him. So, group study can help you a lot.Another scary course is Discrete Mathematics. I never learn about it in high school. It is not like math I got in high school. I learn about discrete values rather than continues. At first, it felt hard, but after I did some homework, I could understand it. My final score is not too bad. You shouldn’t believe that currently I am a Discrete Mathematics Teaching Assistant. It is very awesome.After four months struggling with some odd courses, finally I could finish it well. My GPA for first semester is not too bad. I still could take many courses in second semester. Mostly, I spent my winter holiday for playing online game like Dota and CSGO. Actually my plan was to learn new skills as music, programming language, etc. However, I never did that. In the end of January, there was a famous organization in my faculty which opened for recruitment. I was very interested but I failed to join it. I felt a little disappointment at the time. I thought I had good skill, but finally I knew there were many things to learn. I realized that being in an organization doesn’t only need hard skill but also soft skills. I am not good with people especially the one I barely met. I should learn more and more to improve my skills. I wished I would be accepted the next year.In February, I started my second semester as CS student. I took five courses for second semester and also a course for third semester. As I’ve mentioned above, my GPA is not too bad. Therefore, I could take extra course namely Linear Algebra. Some people said that it is hard. But for me, it is full of concept. If you understand the concept, it will be easy. Thanks to my lecturer, she could explain the concept clearly. I learned so much from her. I am very grateful I passed the courses with good score. So, knowing the concept is the key to pass this course. Don’t memorize any formula and try to understand it.Another difficult course is Basic Mathematics. I survived this but it damaged my GPA. However, I am happy because I know this lesson is very useful in the future. My lecturer is very smart and he taught many concept of calculus. My mistake was I never did any exercise. I have the knowledge but I don’t have the skill. So, If you want to be good at mathematics, you should allocate your time to do exercise. Do it as much as you can.I didn’t participate in any organization that semester, so it just past in a blink of an eye. The summer holiday came and many friends took summer internship. Some of them worked in notable companies in my country. Actually I applied to some companies but they never reply my email. I felt a little disappointment again, but for me it was a reminder. I should study a lot of things, before I can do awesome things. On that holiday, I met new thing called Data Science. I participated in a program that introduced it to me. I was interested to understand it deeply. However, the holiday was finished and until now I never learn about it again.Now, I am on third semester. The course become more difficult. Most of my friends struggle in Data Structures and Algorithm course. For me, this is the first programming course that seems difficult. It is full of problem solving and you should be used to it. You should study for improving your knowledge about data structures and be able to implement it without using built-in library. Few people can understand it in a moment but most people have to practice for a long time to understand it. Discussions with your friends about algorithm optimization will help you a lot. At first, it is hard and strange, but you have to try. Besides knowledge, skill is very important for this course. You should practice to solve problem for improving your skill. For me, programming is not as hard as biology, but practice is the key to master it. If you get difficult problems, don’t panic. Understand the problem and think as simple as you can. If you think you can’t solve it, take a deep breath and start to think again. Approach the problem using different methods or try to simplify the problem. If you get bad score, don’t be disappointed. Take it as your reminder to do more practice. I still do not know my score for this course, but I wish for the best.This semester, I also take web development course. It is difficult because it contains many theories. I should understand client-side and server-side programming. Although those are very different. My lecturer only gives introduction and I should do some digging. Self study is very fundamental in this course. Like other programming course, some of my friends can understand it in a flash. In the other hand, many people find it difficult. 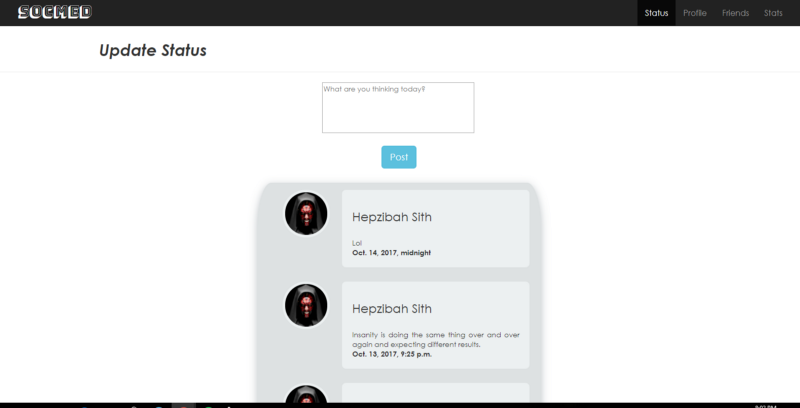 This is my course project. I admit that it is ugly. I made it with my friends. The main problem is time. All of my team members have another assignment and we don’t have time to beautify it. Moreover, I am not good at art and design. I am better with number and problem solving.I mainly talk about academic life as CS student. So, I will talk about social life. In my university, social life in my faculty is quite different with other faculty. I have a lot of “fun”. When I say “fun”, it doesn’t mean happy. “fun” for function. One of my friends think that I refer to “function” when I say “fun”. Yeah, this is the life of CS student. If other students stay awake at night for hanging out, I often sleep late for finishing my code. However, I still have fun in my life. I play games a lot. I’ve spent 2529 hours for Dota and 758 hours for CSGO. Gaming is the best way for your stress management. Sometimes, playing game will free your mind and make you more creative. Another interesting thing is love life as CS student.I learn how to solve problems as simple as possible. The solution should be suitable for any condition, because CS student always think about worst case. As I’ve mentioned before, I don’t have any computer background. Therefore, My programming skills is still on the average. Some of my CS student friends do not like computer. If you are one of them, the very first thing you should do is to be happy. Being CS student is not as awful as you thought. If you aren’t good at it, at least you can try.